Tar Spot: Where are We? Tar spot incidence and severity increased significantly in the Midwest in 2018 with new counties and new states having their first confirmed reports. In some areas tar spot pressure was so heavy that it affected stalk integrity and resulted in early dry down. Yield losses may be possible in fields were tar spot developed early. Researchers in the Midwest are currently working on getting more information on tar spot epidemiology, yield impacts and management implications. Tar spot is caused by the fungus Phyllachora maydis. Not known to be seedborne, this pathogenic fungus could be transported on fresh and dry corn leaves or husks. I have observed tar spot symptoms on decorative corn plants used in local festivals and attractions. Spores released from these plants or their crop residues are also a source of inoculum. Tar spot symptoms include small, raised, black spots scattered across the leaf surface (Pic. 1) leaf sheaths and husks (Pic 2). These black spots, called ascomata, are the fruiting structures of P. maydis. They protrude from the leaf surface giving it a rough or bumpy feel. Ascospores of P. maydis are moved by wind or rain splash to corn. The disease is favored by cool temperatures, high relative humidity and long periods of leaf wetness. Windborne spores are released in periods of high humidity. The ascomata of the fungus most likely overwinters on crop debris. However while they could reduce the local source of inoculum, it is not clear whether rotation and tillage are useful management tools on a large scale as we don’t know how far the spores can travel. So there is the chancel that even if the infected crop residue is buried, spores can still travel from other fields. Regarding fungicides, there is a potential that some of the fungicides we currently use in corn, provide suppression of tar spot. A few corn fungicides have tar spot on their label. I actually had some people approach me to tell me that they had seen a difference in severity levels in fields that where sprayed with fungicide “X” versus no fungicide. Most of the data we have is anecdotal and based on single field observations. The only way to really know whether a fungicide made a difference is to conduct replicated trials on the sample field, hybrid and timing. Timing is actually a key factor in determining whether a fungicide can provide protection from tar spot or not. The big question on this matter comes from the fact that we currently don’t know when the disease arrives to our field so that we can time our fungicide applications accordingly. Hybrid selection will probably be our #1 tool during the next growing season. Researchers at the of Illinois and Wisconsin conducted replicated trials with several hybrids and rated them for tar spot incidence and severity. Significant differences were observed in severity across all these hybrids so we hope that this information along with more knowledge of tar spot epidemiology can provide some useful insights to manage this disease next season… or at least to not get caught off guard. Stay tuned for more information. Picture 1. Tar spot lesions on leaf surface. (Source:GROWMARK, Inc.). Picture 2. 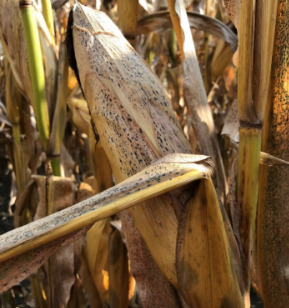 Tar spot lesions on husk (Source:GROWMARK, Inc.). Early planting increases full-season canopy phtosynthesis, which can improve yields, but with reward comes risks. Be ready to manage them.. Early season pests can be devastating to the crop’s establishment, especially if the seed is unprotected and conditions are ideal for infestations (weather conditions, preceding crops, soil type, field history etc.). Preplant sampling is recommended for certain soil pests, especially those for which rescue treatments are not available. Sampling is necessary to diagnose insect problems in a field and to take appropriate measures of control. In this article we will review some of the most important early season pests of corn and their recommended sampling time and methods. Sampling for these pests will take place from preplant to about V5.